The heroic image of Paul Cezanne depends upon the notion of a constant battle between his innately passionate temperament and his conscious, reasoned quest for le style, and Cezanne was described as the one fundamentally classical painter of his generation, 'the Poussin of Impressionism'. This was a widespread perception, and it is clear that as Picasso emerged from his 'exorcist' phase in 1908 Cezanne served to bridge the gulf between art negre and the classical tradition. 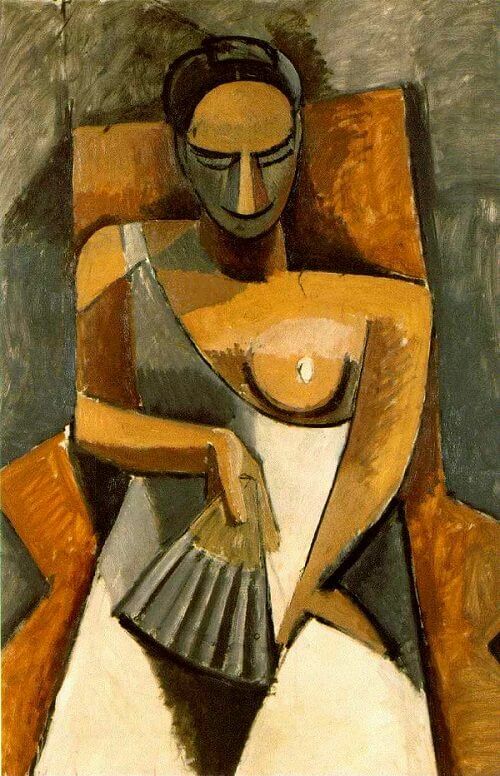 In Woman with a Fan (1907), which was probably painted in the late spring, a beautiful and very personal balance between the differing voices of Cezanne, art negre and early Greek sculpture is achieved, and achieved, it seems, quite naturally, without tortured struggle. A radiograph of this head area of the Woman with a Fan shows that Picasso began by following the drawing in making the woman stare directly out at the spectator, in the completed painting it is the single uncovered breast which, Cyclops-like, stares unblinkingly, and all trace of individuality has been erased. With her white shift, rigid pose and throne-like seat, the woman seems like a priestess withdrawn in profound meditation, and since the viewpoint demands that we look up at her and she is much over life-size, we are bound to feel overawed. On this occasion Picasso did not draw upon Cezanne and art negre to project atavism, roughness and inner tension, but awesome majesty. There are echoes of the stately late portraits of Madame Cezanne, but Picasso chose an austere palette of a few browns and greys, which could hardly be more different from Cezanne's vibrant prismatic hues and which reinforces the overall impression of formal abstraction produced by the insistent pattern of triangular shapes.